At the moment, there are no details on when PLUS RFID will be launched to the public. You can register for the pilot here, read the FAQ in Bahasa Malaysia below for more information. Where to sign up as pilot tester? You can 》register for the pilot here, read the FAQ in Bahasa Malaysia . I also want to sign up as public pilot. 6. If use TnG card at parking, most has 10% surcharge. This is for “administrative” fee for transferring money from TnG to parking operators since TnG/parking operator couldn’t agree to absord this miniscule cost and therefor charge its users instead. Isn’t bank IBG transfer is free now? And why must this cost based on percentage? Isn’t the cost to transfer RM10 the same as RM20? Isn’t using digital payment REDUCES cost i.e. no need to prepare paper parking ticket or handle cash from machines? Anybody who has handled big amount of cash from machines know how tedious and relatively costly this is. Why can’t toll users be charged based on usage? For this I applaud a system like PLUS. There can be a mechanism to ensure minimum balance and avoid hold up at toll gates. if we have 10 operators, we will have 10 RFID stickers on the car windscreen. I was thinking the same too as I thought the Touch n Go RFID was the default RFID for all tolls. I already have 2 RFID tags on my car, one for my condo and another for TnG. Will have to make space for PLUS somewhere in the future. always got detection problem…. fitment on the windscreen or headlamps don’t guarantee 100% pass through. sometimes will get double deduct. 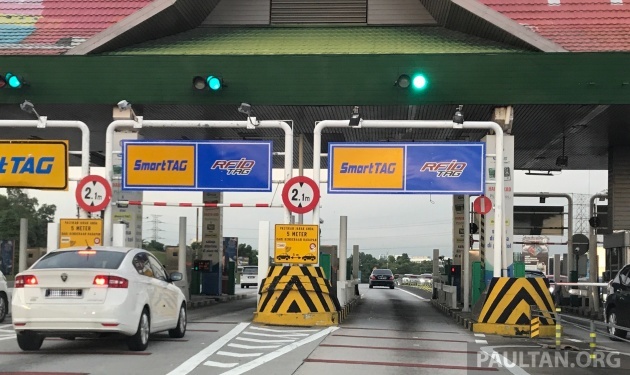 The article said PLUS RFID will be able to use the TnG RFID lanes so does that mean if we use either system we will still be able to pass through their RFID lanes and at some point PLUS will open the Penang bridge RFID lane will be usable for TnG RFID users? That’s a bit of confusion there on the coexistence of multiple RFID players. How does this work? Singapore to implement satellite road toll system from 2020. Their present one Electronic Road Pricing ( ERP ) which was started in 1998 is also gateless, supply by Mitsubishi through tender. Even UK sent their team to learn from Singapore. Why is Malaysia always using a inferior system. From the above photographs it is still gated. It will be jammed during peak hours. Still dumb. Forever jammed. Learn from Singapore. Our RFID is junk not practical, have to glue the RFID to the headlight. Singapore vehicles just use a device known as an In-vehicle Unit (IU) from Mitsubishi on the dashboard inside the vehicle. Get rid of sticker type of RFID before too late. Better still get the latest GPS type. Don’t always get cheapskate technology at crony cut throat price. Anthony Loke wake up, do something. OMG. Why must you introduce another system? Why not use the same one. Standardize. Does this meam that in the future cars will be ‘full’ of RFID stickers? It’s stupid that we have two systems. This system of deducting direct from the credit or debit card is much better instead of maintaing yet another eWallet. Just settle on one system and roll it out. As always…damn confusing again. Do we need to have 2 RFID stickers now? I already carrying Smart Tag, Additional TnG Card and this RFID…need to stick another 1? Will the RFID users still enjoying 20% off for passing Penang Bridge Toll? Yes, I also have the same question, how to integrate plus RFID with the Penang Bridge 20% discount for Penangties?